28/6 Update: NSW will name their squad at halftime of the Canberra v Canterbury Round 16 fixture. Here is a predicted 18 man squad... but to be truthful I have no idea what direction NSW go - this is my best guess. 28/6 LATE UPDATE - Picked the 17... only Hindmarsh was the one left out of the 18 man squad I listed. His omission is deplorable. 28/6 Update: The big question for Queensland is who makes way for Petero Civoniceva who missed Game 2 with a hand injury. You can almost guarantee this will be the 18 man squad named on Tuesday. 29/6 Update: Ben Hannant was dropped for Civoniceva, with Ben Lowe the new 18th man given the Rabbitohs have the bye. |=| Full Origin 3 Preview to come on wdnicolson.blogspot.com and check out the State of Origin Series Page. Here on wdnicolson.blogspot.com and on The NRL Tweet - we will have State of Origin covered better than most. Subscribe to the NOT The Footy Show Podcast via iTunes by clicking this link. <> NOT The Footy Show will be covering State of Origin with our combination of Videos & Podcasts throughout the 2010 Series. Note: All 'What player brings to Origin' notes + stats are pre-Game 1, 2010. NEW PLAYERS FROM GAME 2 ONWARDS. QLD - Allan LANGER 34, Mal MENINGA 32, Wally LEWIS 31, Darren LOCKYER 30, Steven PRICE 28. NSW - Brad FITTLER 31, Andrew ETTINGSHAUSEN 27, Laurie DALEY 23, Andrew JOHNS 23, Rod WISHART 22. QLD - Dale SHEARER 12, Allan LANGER 10, Greg INGLIS 8, Darren LOCKYER 8, Wally LEWIS 7, Bob LINDNER 7, Billy SLATER 7. NSW - Michael O'CONNOR 11, Brad FITTLER 8, Timana TAHU 8, Andrew ETTINGSHAUSEN 7, Ryan GIRDLER 7. QLD - Wally LEWIS 8, Allan LANGER 4. 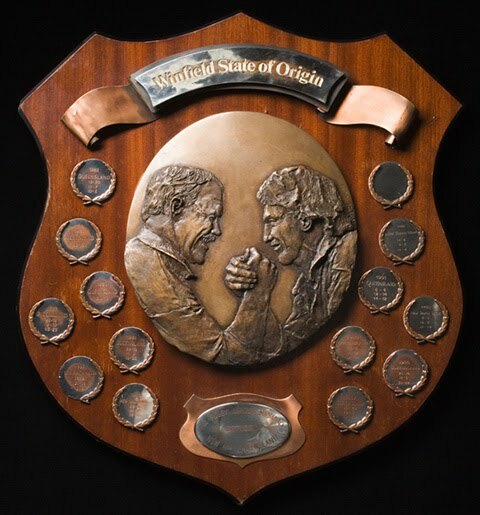 NSW - Andrew JOHNS 4, Peter STERLING 4.
WHO WINS THE 2010 STATE OF ORIGIN SERIES? Game I - Wednesday May 26 @ ANZ Stadium Sydney. Game II - Wednesday June 16 @ Suncorp Stadium Brisbane. Game III - Wednesday July 7 @ ANZ Stadium Sydney. NSW haven't tasted a Series Victory since 2005... while Queensland will be looking to win an incredible 5th straight Series! Bring on the CANETOADS & their UGLY MUGS!